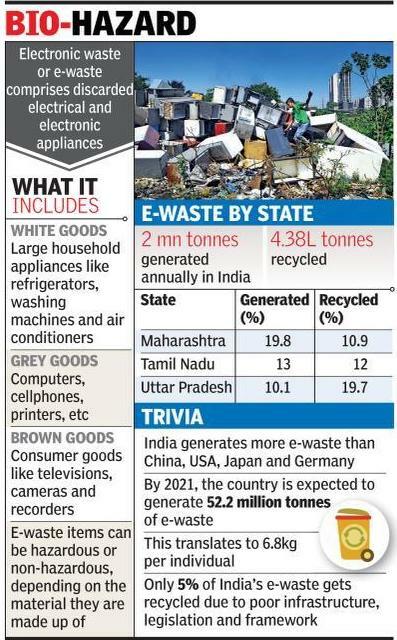 PUNE: A study has found that the state generates the most e-waste in the country, but ranks very low on recycling it. According to the report jointly published last week by the Associated Chambers of Commerce and Industry of India (Assocham) and Japan’s NEC, India produces 2 million tonnes of electronic waste per annum and recycles 4,38,085 tonnes. E-waste typically includes discarded computer monitors, motherboards, cathode ray tubes, printed circuit boards, mobile phones and chargers, compact discs, headphones and white goods. Among Indian states, Maharashtra generates the most e-waste (19% or 3.96 lakh tonnes), but recycles only 47,810 tonnes, finds the report. This is the highest among all the states, stated the report. E-waste management rules that were introduced in 2016 introduced goals for manufacturers; the government has set a target of collecting and recycling 70% of the e-waste by 2023. The report expressed scepticism about achieving the target, based on its findings. Over 95% of the e-waste generated is managed by scrap dealers and the unorganized sector, who dismantle and dispose of the waste instead of recycling it, the report stated. The report also questioned the effectiveness of the state pollution watchdog, Maharashtra Pollution Control Board (MPCB), in implementing the 2016 rules. MPCB officials, however, told TOI that they are readying an inventory of e-waste generated in the state and will take necessary action. “We have recently appointed an agency to give us an inventory of e-waste in the state. The report will be submitted in two months. We will then take action,” said MPCB assistant secretary P K Mirashe. Among other states, Tamil Nadu produces 13% of India’s e-waste and recycles 52,427 tonnes (10.9%) and Uttar Pradesh (10.1%) recycles 86,130 (19.7%), the report stated. In Pune, Kalyaninagar has the best e-waste collection-recycle ratio, thanks to the residents’ tie-up with an e-waste collection company. According to residents, e-waste is collected from societies on a quarterly basis. “Pockets in Pune are also adopting this method, but there’s a long way to go,” said Shabnam Fazal, a resident. The Assocham-NEC report also stated that India produces the most e-waste, ahead of countries like China, USA, Japan and Germany. The overall volume of e-waste in India is growing at a rate of 20% per annum. Where it was 44.7 million tonnes in 2016, the number is expected to touch 52.2 million tonnes by 2021.